Marine bundle package for the Iridium GO! Iridium GO! 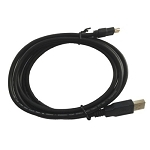 Marine Bundle with mast antenna, 10-m antenna cable and adapter cable. The Iridium GO! 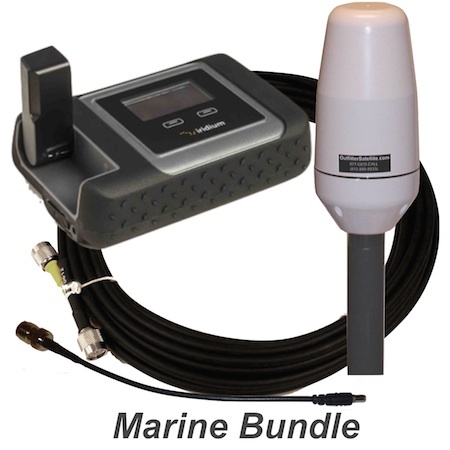 Marine Bundle is everything you need to implement your Iridium GO! below decks, including a marine-grade mast antenna, 10-meter antenna cable, and antenna adapter to connect to the Iridium GO! hotspot. The Iridium GO! provides a WiFi signal that lets you make or receive phone calls from your iOS or Android smartphone or tablet. You can also send and receive text messages and emails. The Iridium GO! Unlimited Data +150 Plan gives you unlimited data for email, unlimited SMS messaging, and 150 minutes of Basic Rate voice calls every month. It is a great plan if you want to use the Iridium GO! to provide GPS position reporting. Special apps are available for downloading GRIB files, doing email, photo sharing, and Twitter. Outfitter Satellite does not recommend web browsing as an effective application of the Iridium GO! because of its relatively slow 2.4 kbps data speed. Optional US Phone Number: When an inbound call arrives, all* connected smart devices will ring. Any smart device user connected to the Iridium GO! can receive an inbound call or pass it to a different smart device user. Voicemail and two-stage US phone number access are included with the service fee. 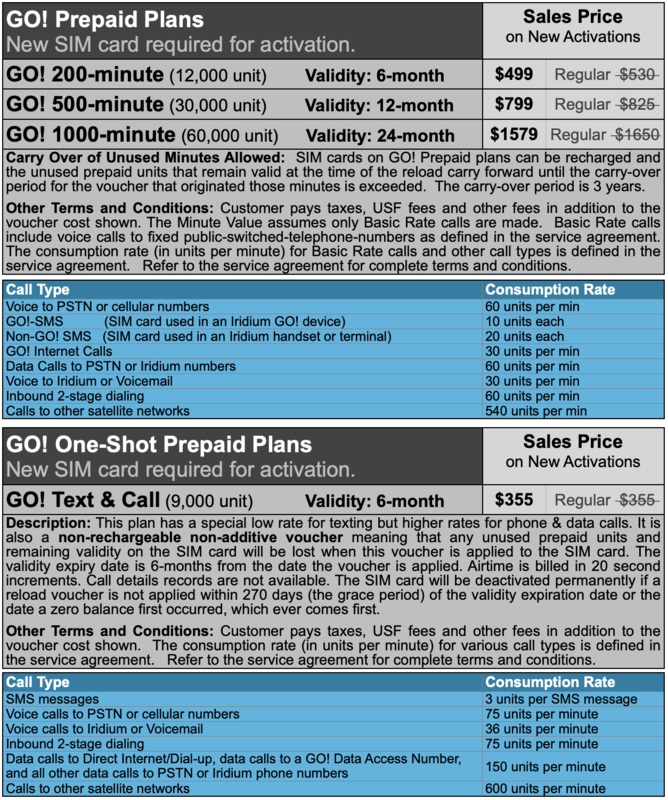 A dedicated US phone number option is available for an additional monthly fee. 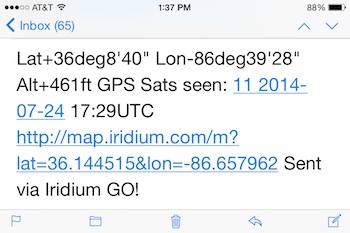 Global Location Tracking: The Iridium GO! is a powerful global tracking device. Select a time interval for transmitting new position reports. Identify the email address to receive the reports. Each time-stamped email report contains your latitude and longitude. A hyper link in the report will also allow a quick graphical display of your position. An optional password-protected web-based service can store and display your location history for additional monthly fee. S.O.S. Messaging: If you have an emergency, a single button press will send a text or email alert that includes your GPS location. Simultaneously, a phone call is initiated to a pre-designated number of your choosing. Basic GEOS emergency response services that can be integrated with the S.O.S. button are included with your activated Iridium GO!. When a GEOS user presses the S.O.S. button, he or she is connected to a trained professional that can give critical advice and alert emergency response services near the user's location. * The administrator of the Iridium GO! can limit the privileges of specific users, e.g. allow them to send texts but not make or receive phone calls. 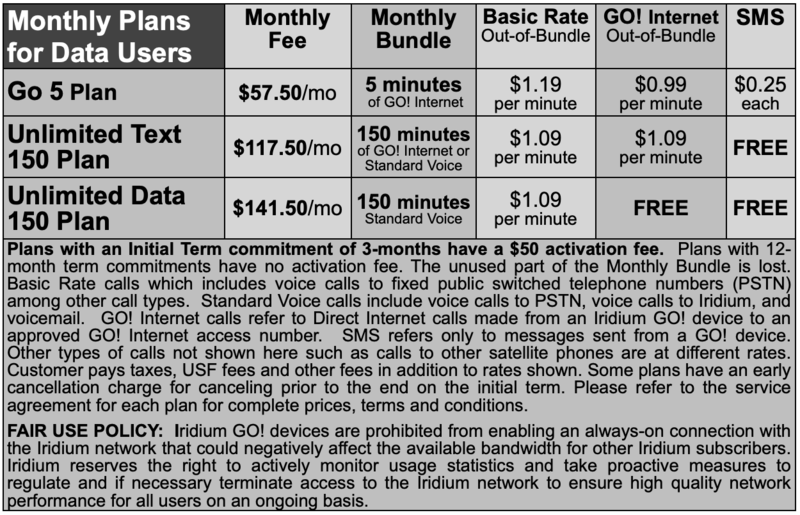 The monthly fee of some postpaid plans for the Iridium GO! includes an unlimited amount of SMS messaging. Usage of other services such as voice calling is at additional cost as described in the service agreement(s). Other fees such as USF fees and taxes are charged in addition to the monthly service fees quoted above. For complete information please refer to the service agreement. The Iridium GO! only has a 2400 bps data rate so it is not a broadband internet device. Skype and other broadband applications are not supported. The Mail & Web app is effective for light email activities, but Outfitter Satellite does NOT recommend it for web browsing, unless special mobile-optimized websites are used. Q: Does Iridium Go support iOS10.2 and Win 7 and 10 ? A: With regards to the IOS, the GO! requires iOS 6.0 or later. Compatible with iPhone, iPad, and iPod touch. The Iridium GO! works with either an Apple app or an Android app. Tell me more about your use case with regards to Windows 7 and 10 and I can give you some more information! Q: Does the Marine Bundle include the Iridium Go Phone? It is not listed in the description. Can you ship to Portugal, or do you have a Portuguese fulfillment center? GEOS Brochure: GEOS global emergency response services are provided at no additional fee with the Iridium GO!. To use GEOS, the end-user must register online. We do not have a fulfillment center in Portugal nor do we currently ship international. You can use a freight forwarder or if you have a friend or relative in the United States who can forward the product to you - we can ship to them. 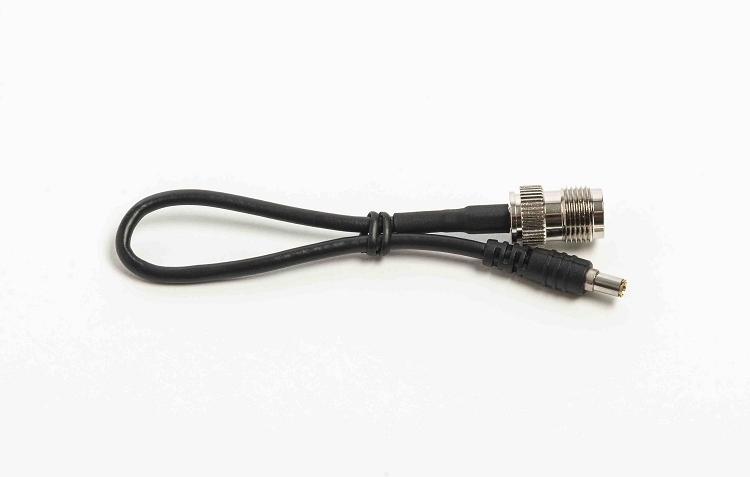 A: The antenna should be mounted on a standard 1" threaded pipe of any length you choose. You can then mount the pole anyway you would like for your application. We currently do not ship internationally. You can use a freight forwarder or if you have a friend or relative in the United States who can forward the product to you - we can ship to them. You would also need to pay via a credit card with a US-based address or pay via International wire. Dimensions: 4.5" x 3.25" x 1.25"
Supported OS: iOS 6 & 7, Android 2.3.x Gingerbread, 3.x.x Honeycomb, 4.0.x Ice Cream Sandwich and 4.1.x/4.2 Jelly Beam with updated versions to be made available to follow Android releases. *IMPORTANT: The Iridium GO! is not a broadband internet device. It has a 2400 bps data speed which is suitable for light email applications performed using the Mail & Web app. Outfitter Satellite does not recommend other data applications such as web browsing unless you are accessing special mobile-optimized websites recommended by Iridium.